10-15 April. This short but very sweet trek has you hiking up and out of Lençois, across valleys and rivers, and then up the rocks of dry riverbeds. Wild camping at night, you sleep by the side of rivers and hike up the deep canyon to the bottom of Fumaça, the highest waterfall in Bahia. Next morning you have to hike out of the canyon to see it all from the top! Following the trek is two days of mountain biking, the first around the scenic Vale do Capao, the second a day of mostly single track past Morrao and then downhill to Lençois. This short but very sweet trek has you hiking up and out of Lençois, across valleys and rivers, and then up the rocks of dry riverbeds. Wild camping at night, you sleep by the side of rivers and hike up the deep canyon to the bottom of Fumaça, the highest waterfall in Bahia. Next morning you have to hike out of the canyon to see it all from the top! Following the trek is two days of mountain biking, the first around the scenic Vale do Capao, the second a day of mostly single track past Morrao and then downhill to Lençois. 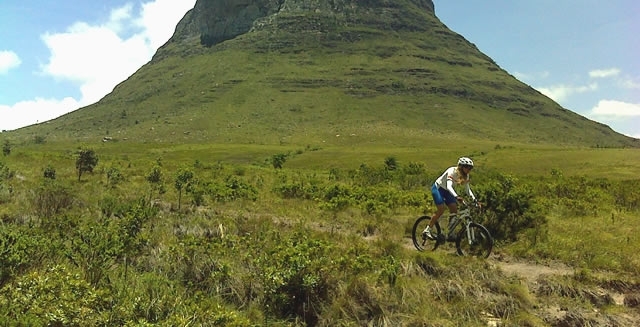 Dates: Arriving in Lençois on 10 April, the trek goes from 11-13 April, then the mountain biking on 14 and 15 April. You can stay that final night in Lençois or leave on the overnight bus. 10 April. You travel to Lençois in the Bahia interior, either by plane (Thursday/Sunday only), public bus or private vehicle. The road west from Salvador passes market towns, plantations, and the dry lands of the Sertao, the Brazilian desert interior. 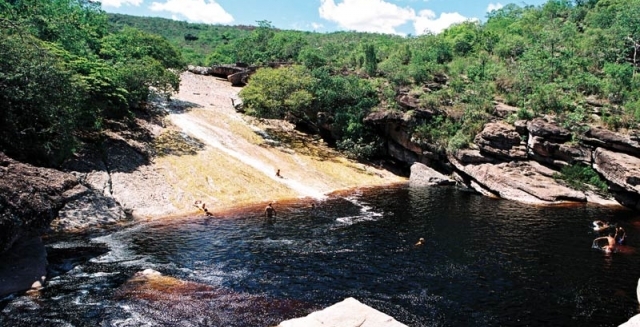 The area around the old diamond mining town of Lençois and the National Park of Chapada Diamantina is an oasis in the dusty outback. 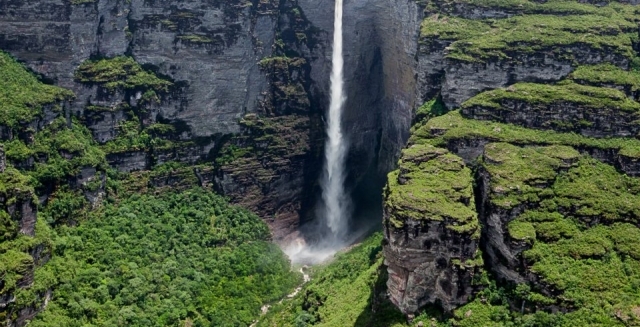 Flat-topped mountains rise to 1600m, and the valleys between them are covered in lush forests and tumbling waterfalls. After arriving you can explore the cobbled streets of the charming colonial town, or swim at the beautiful Serrano Falls a short walk upriver. 11 April. 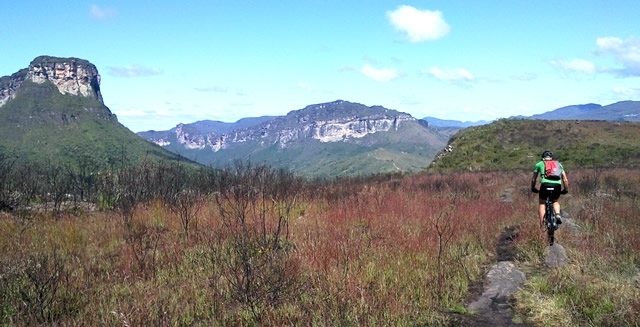 You begin your Chapada Diamantina Trek straight from the village of Lençois, striking out for the hills above town. The first 8km of the 12km to hike are in the open, traversing the rocky and with fabulous views back down to town and beyond, climbing 400m to 840m asl or so. Orchids add splashes of colour to the landscape. First stop can be the highly dangerous rock slide on Ribeirao do Meio! After a trail lunch with a view, you drop into the next valley, with difficult hiking up the rocks of a riverbed, which can be difficult in wet weather. Camp is above Cachoeira Capivara, sleeping under the overhanging rocks. After dinner you can fall asleep to the noise of the river. 12 April. A quick morning dip in the river to wake yourselves up and refresh can also include a 6m cliff jump into the pool below the falls for those who dare! 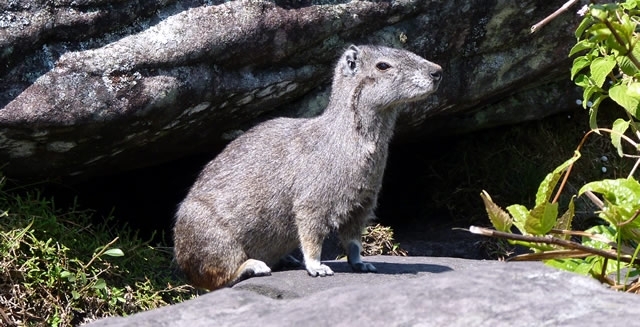 You continue up the riverbed of the Rio Capivara until you reach the entrance to the deep canyon into which falls Cachoeira da Fumaça, the highest waterfall in Bahia at some 390m - so high that the water doesn\'t reach the bottom! After leaving your bags, you hike up the 3km long canyon to the pool in the afternoon, with dizzying views up the canyon walls. After time for a quick swim you return to the campsite at the canyon mouth to spend the night. The day involves only around 8km of hiking but it can be tough and technical. 13 April. Morning brings the tough climb out of the canyon to the flat summit of the Serra do Sincora above, the first 2km of hiking including some steep scrambling in the 500m of climb. Another km of flatter ground takes you the top of Fumaça with fabulous views back down the canyon that you already hiked. The views along the valley and to other chapadas are stunning. You can also peer down to the lake from an overhanging rock... if you dare! The final part of this section of your trek is the 4km flat hike across the summit, before the stunning Vale do Capao opens out before you, and you descend the steep 1.5km to the bottom, then the final section to the valley. 14 April. Today brings a ride around the trails to enjoy some of the waterfalls that tumble down from the escarpment in the Vale do Capao, and refresh in them. Riding out from the village through the lush vegetation on the dirt roads and then single tracks, you first head to the small community of Conceição dos Gatos, nestling on the lower slopes of the hills. 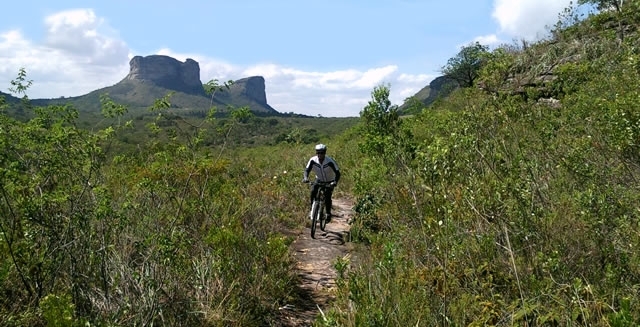 This is the nearest village to visit Cachoeira de Baixo just 2km away, and then cycle up the short trail to Cachoeira da Boa Vista, which boasts views from above as the name suggests. There are many more trails around the Vale do Capao, single track and dirt road, that can be explored in the afternoon if you need to ride some more. 15 April. Around 40km of pedalling takes you back to Lençois. 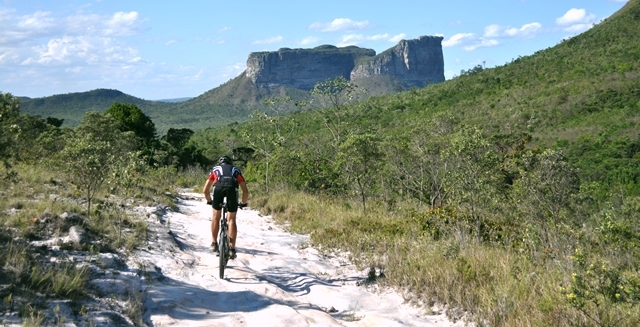 The journey out of the Vale do Capao begins on the dirt road before the single track around the shoulders of Morrao, the highest table mountain in the region. 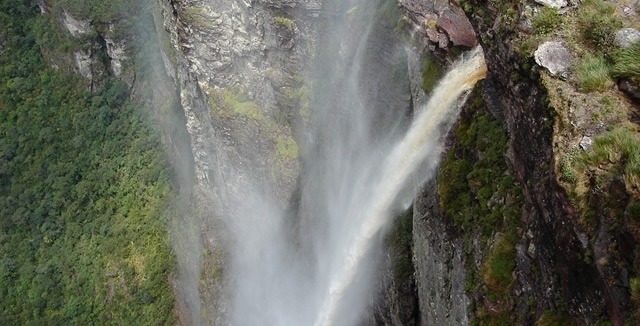 After a stop at the Aguas Claras Waterfall, you continue to Pai Inacio, perhaps the easiest chapada to summit. 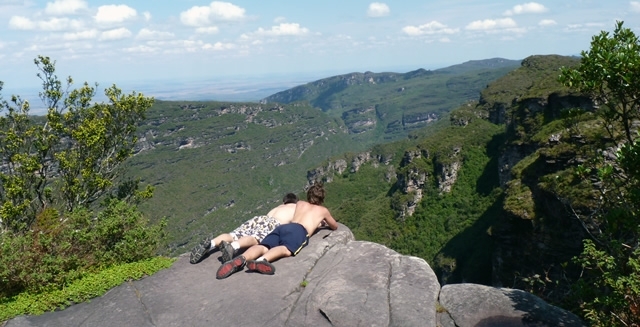 After making it to the top, you have fantastic panoramic views over the Chapada Diamantina National Park. The single-track to Lençois takes you along rocky paths with some technical riding and a long downhill until the town. Evening is then free to enjoy Lençois, with plenty of bars and restaurants to unwind. 16 April. 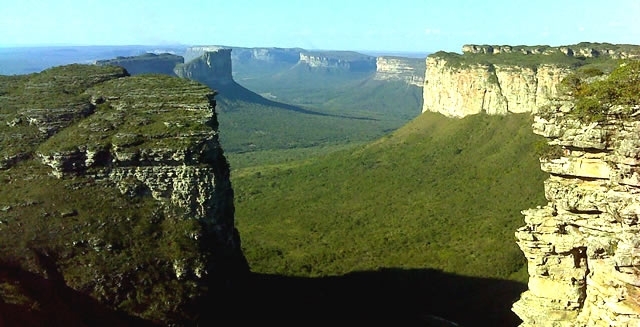 Your time in the Chapada Diamantina National Park comes to an end with the journey back to Salvador. The twice-weekly flight is recommended for Thursdays and Sundays, or the public bus for other days. You can also take the overnight bus back to Salvador on 15 April. The tour can also be combined with other adventurous destinations in Brazil, such as Rio de Janeiro and the Amazon Rainforest. You may also like to extend your time in the state of Bahia to enjoy the beautiful beaches of Praia do Forte or Morro de Sao Paulo.